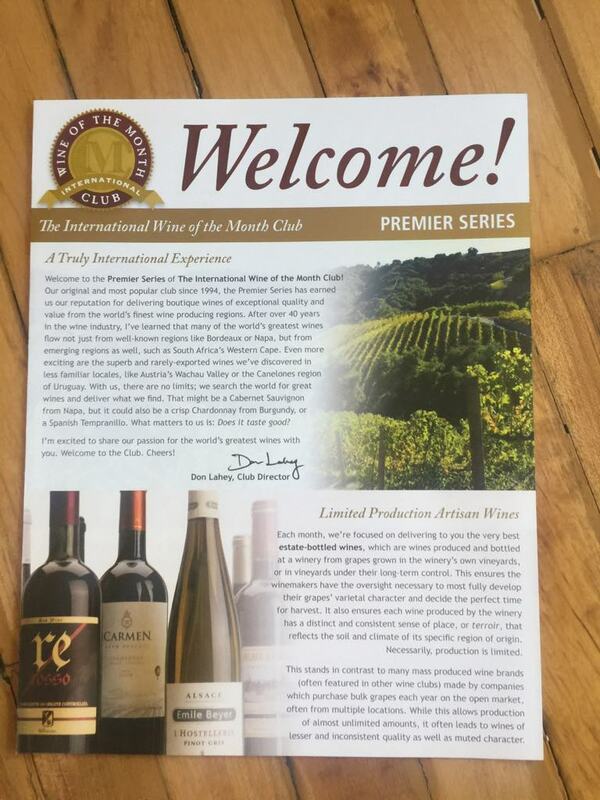 The International Wine of the Month club focuses on sending their members some of the highest quality wines from all over the globe. They have over 40 years of experience in the wine industry and know how to choose the best wines. 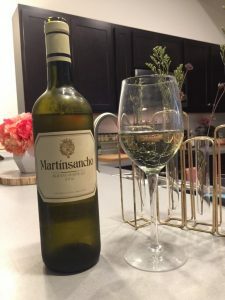 They feature limited production artisan wines, which means these wines are not mass produced and are made by winemakers who are passionate about their wine. 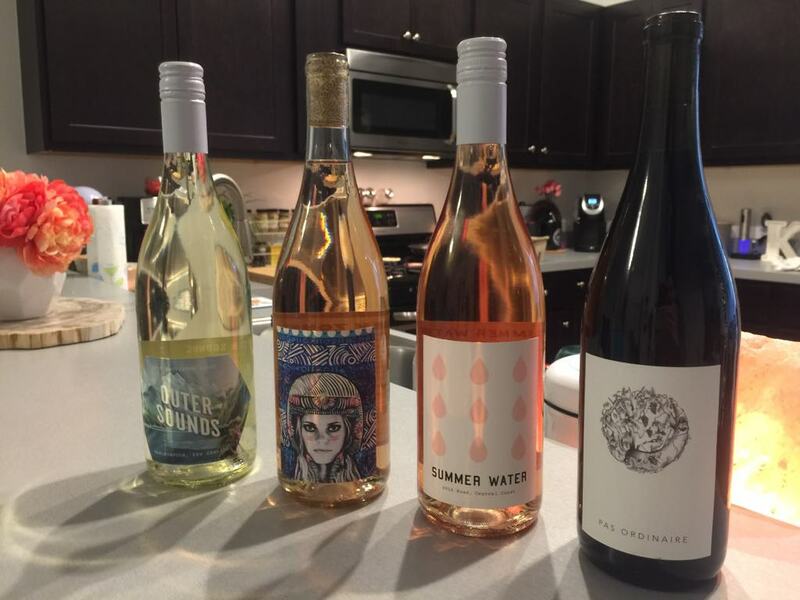 You can customize your orders to have all reds, whites, or a combination, can change your preferences at any time, you can reorder your favorite bottles, and much more. 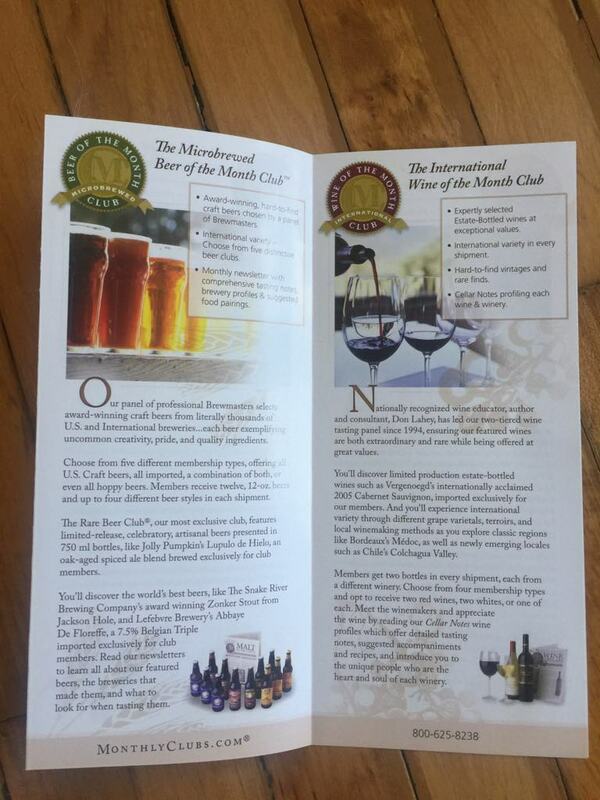 A club for those who want to branch out and enjoy excellent quality international varieties of wine. 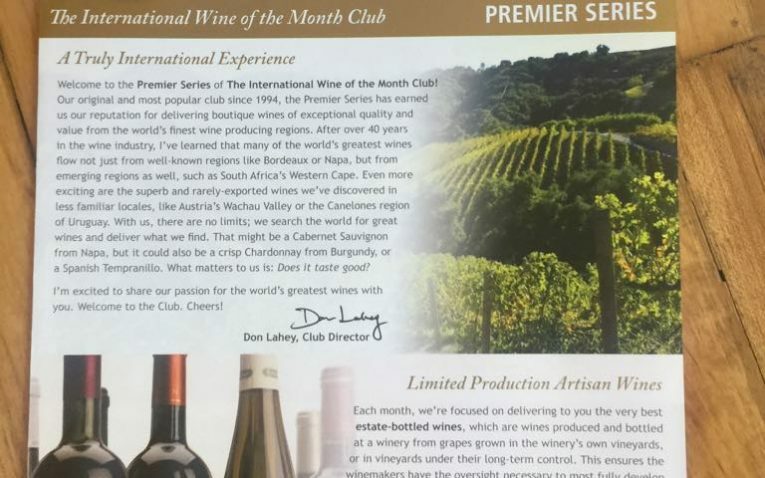 Who Would the International Wine Of The Month Club Most Appeal To? This club has a wide selection of wines. 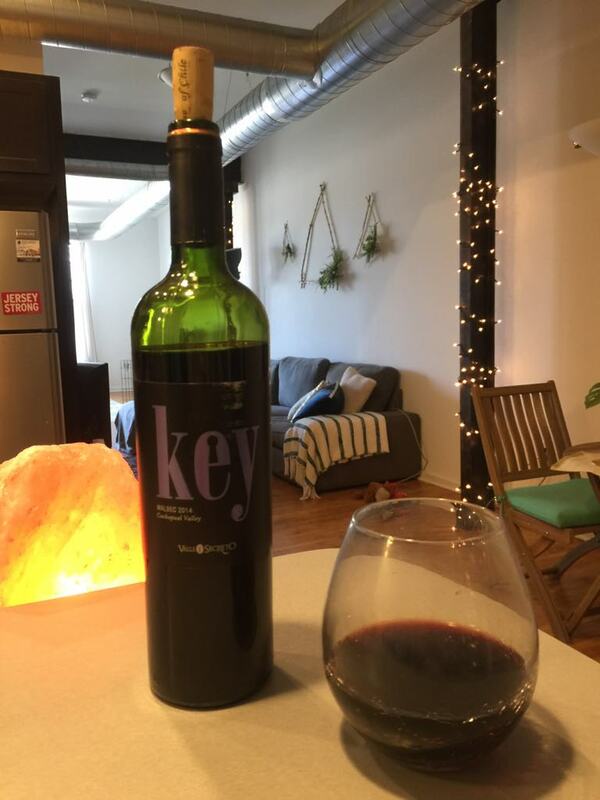 All of their wines from all membership levels are small batch, vintage, rare, and estate bottled wines. 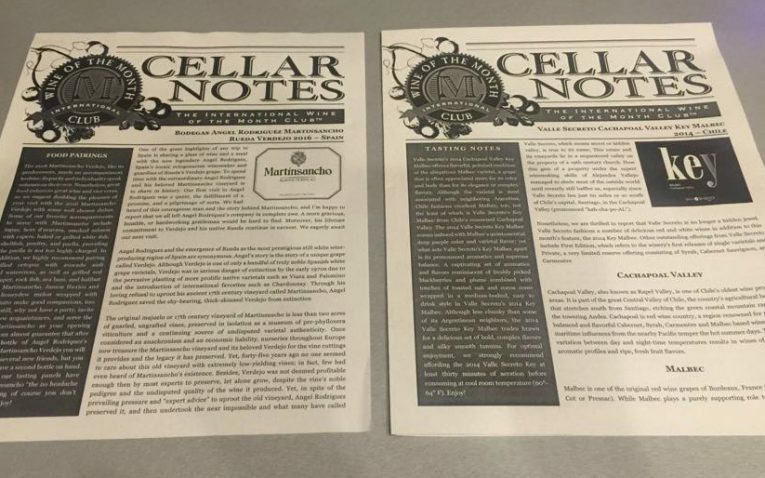 Their Collectors club also has very rare, collectible, and hard to find wines as well. It does not seem they offer sparkling wines or rose, however. 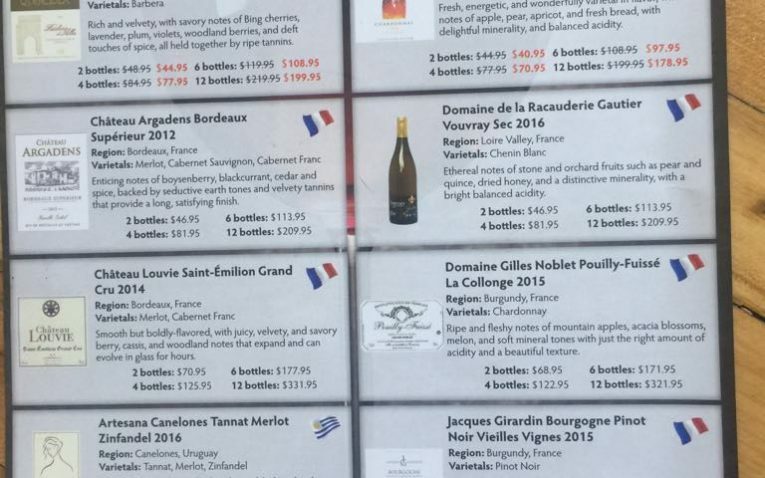 They feature wines from all over the world, including wines from the United State as well. Unless you opt for the red wine membership, each level allows you to selection all reds, whites, or a combination of the two. 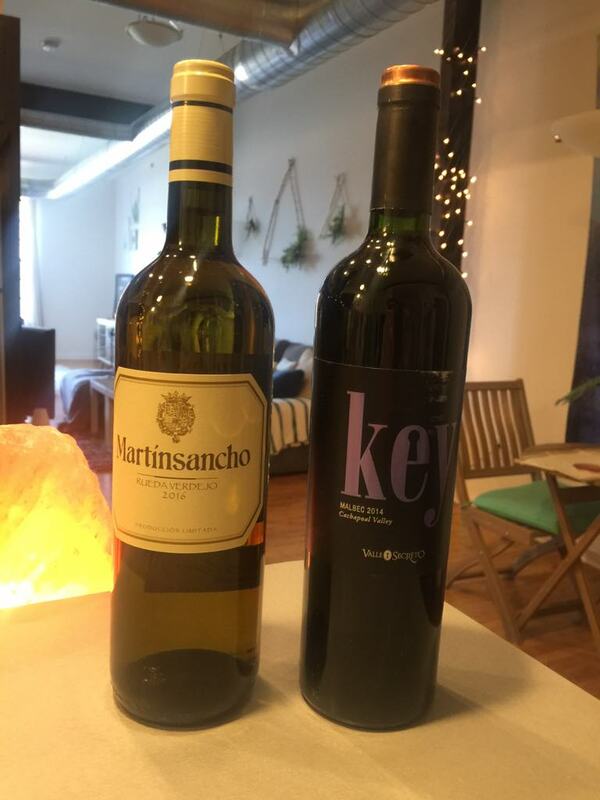 Each shipment only comes with two bottles of wine, but you can choose the frequency of your shipments.You cannot choose the wines you get every month with their memberships as they are picked for you by their experts. 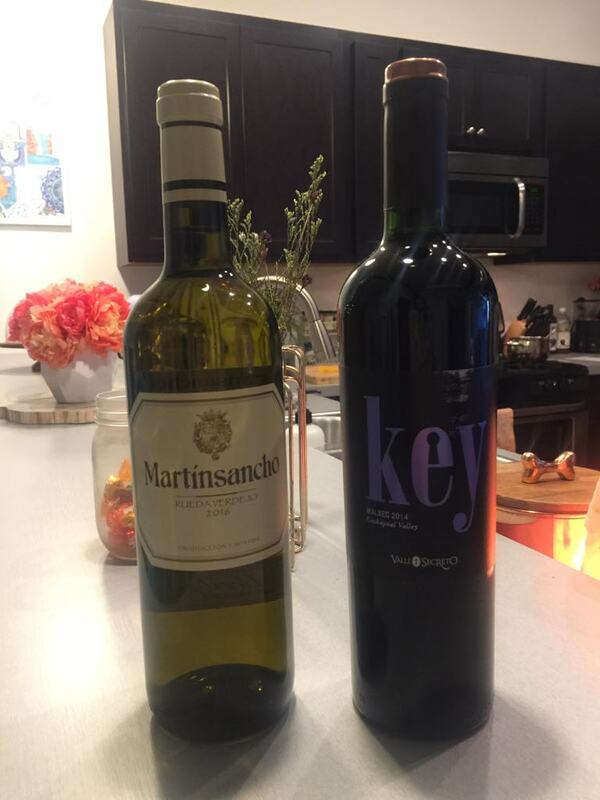 I really likes my wines from this club and they were both delicious, well balanced, and were great quality. Both wines were easy to drink and not offensive in any way like often times wines can be. 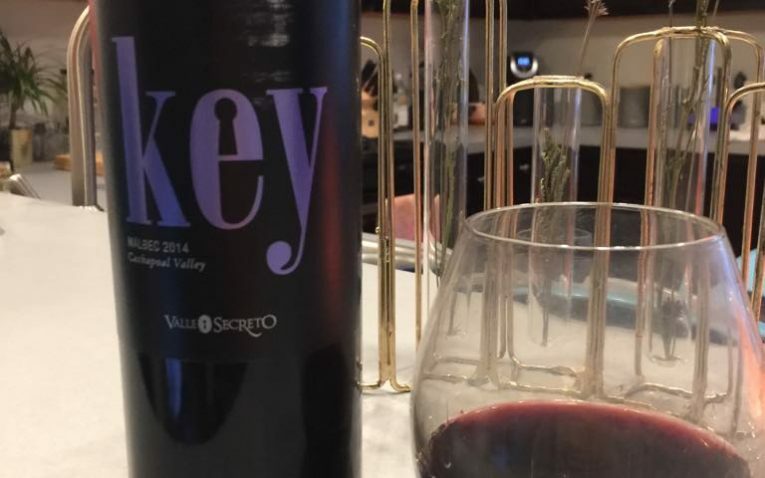 The fact that this club only focuses on small batch and never any mass produced wines is part of the reason they can provide wines with such spectacular quality. You can taste the love and care that goes into the bottles. I can only assume that their higher priced clubs, rare wines, collectible, etc. are just as good, if not better, and would suit just about any wines drinker’s taste. 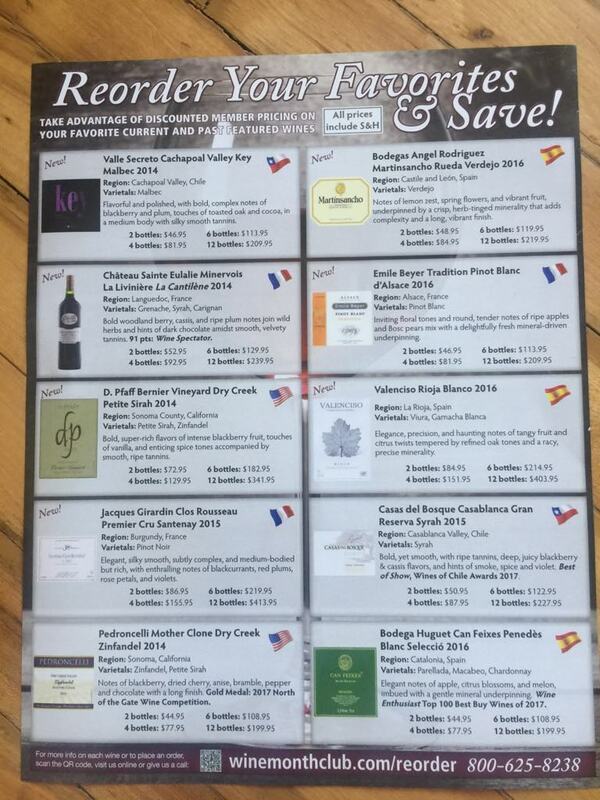 Overall, wine price and memberships are a little higher than most of the competition, especially since you are only getting 2 bottles of wine in each shipment. There are no monthly contracts or sign up fees, which is a bonus. You can choose shipments every month, every other monthly, or quarterly. You can also choose to pay as you go or you can pay in one lump sum, which many other clubs do not offer. Furthermore, shipping on every order is a flat rate of $13, which is pretty pricey, especially for their higher membership prices. Many other clubs have free and much faster shipping. Each membership level ranges in price and you are sure to find a club that best fits your tastes and budget. They also have a no-questions asked money back guarantee if you do not like one of the wines you get in your shipment. They will replace or refund any wine that does not meet your high standards. 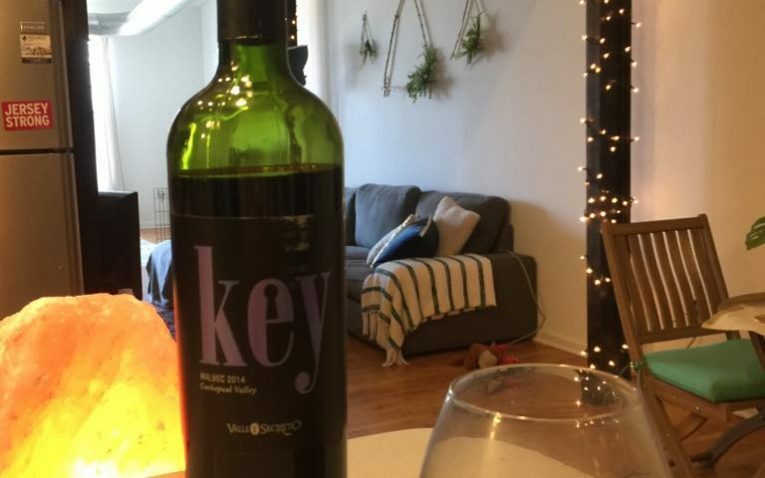 This is their most popular wine club option. 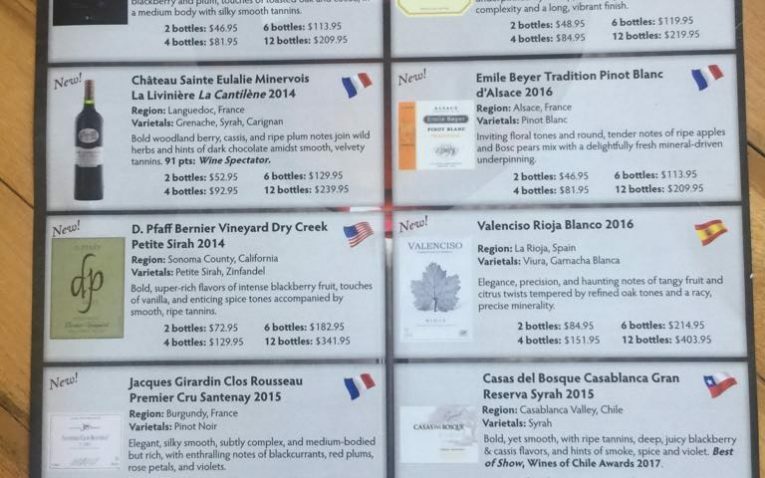 This club features boutique wines from all over the world and are of the finest quality. 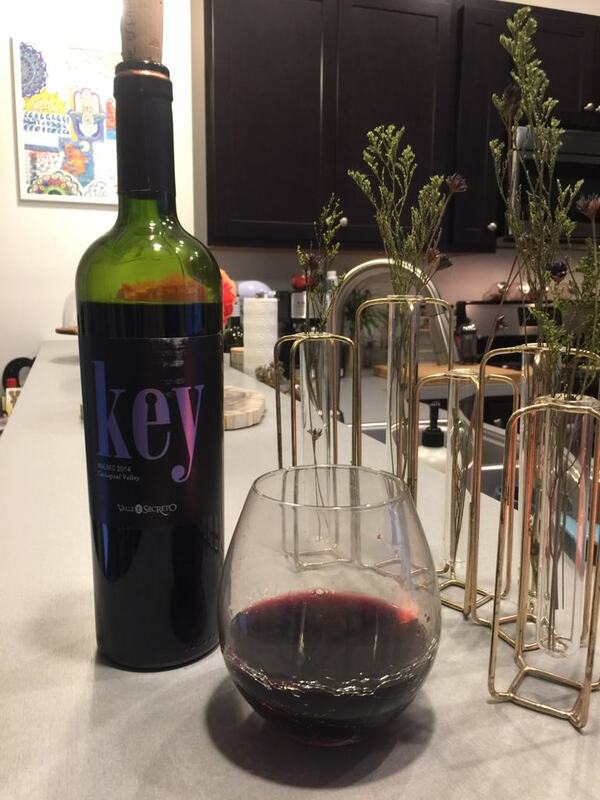 Each shipment include estate bottled wines, wines from all different regions of the world, vintage and rare wines, cellar notes about the wines and winery, and ability to reorder your favorite wines. You can choose all red, whites, or a combination plus how frequently you want to get your orders. Of course, this level only offers fine red wines. Red wines are robust and from all around the globe. All of the reds are small batch, limited, boutique wines as well. 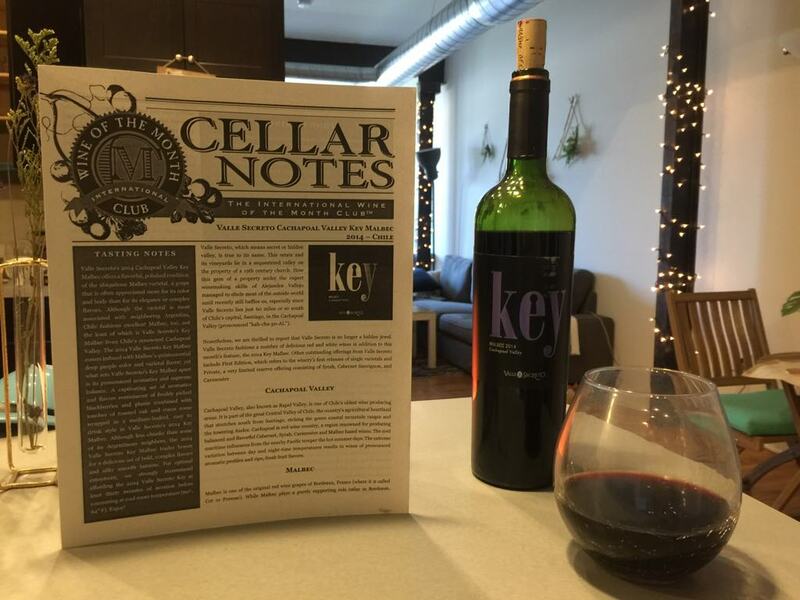 They have medium to full bodied reds with deep fruit flavors and the perfect balance. It also includes everything you get in the Premier Series. 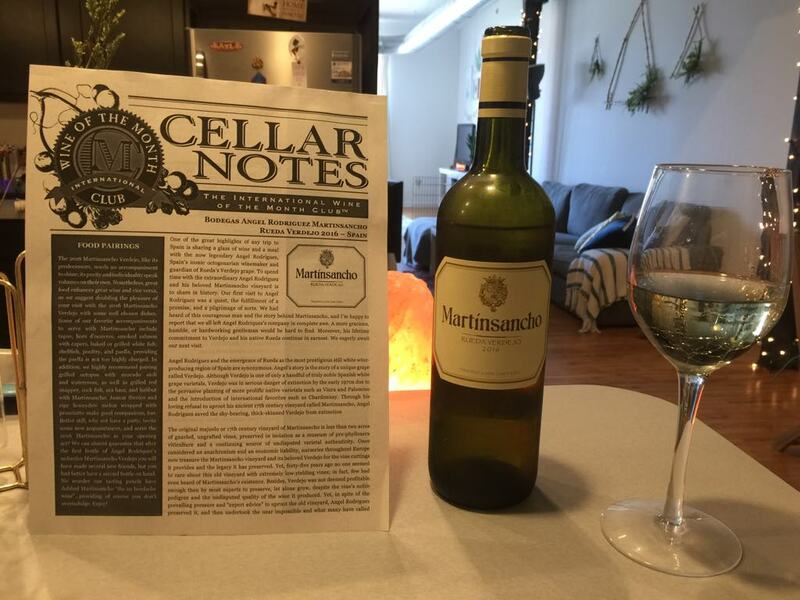 This wine series features the luxury of tasting and cellaring Collectors Series, but is a bit easier on the wallet. 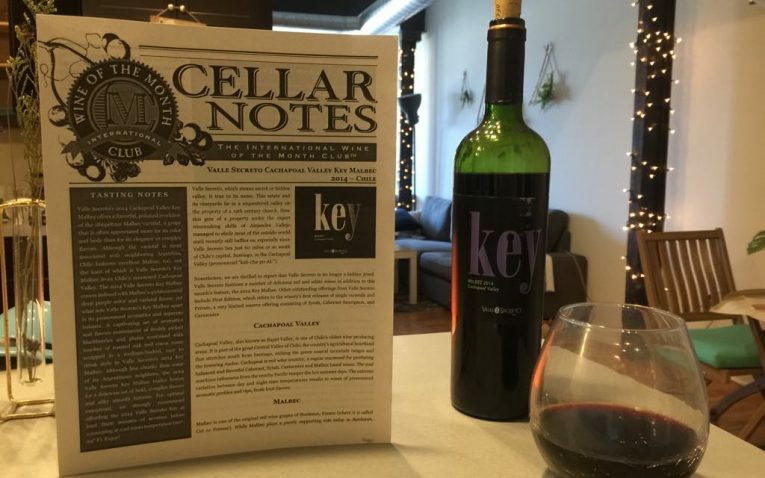 It is a combination of wines from the Premier Series and the Collectors Series – one bottle from each level. Again, you get everything from the Premier Series as well. 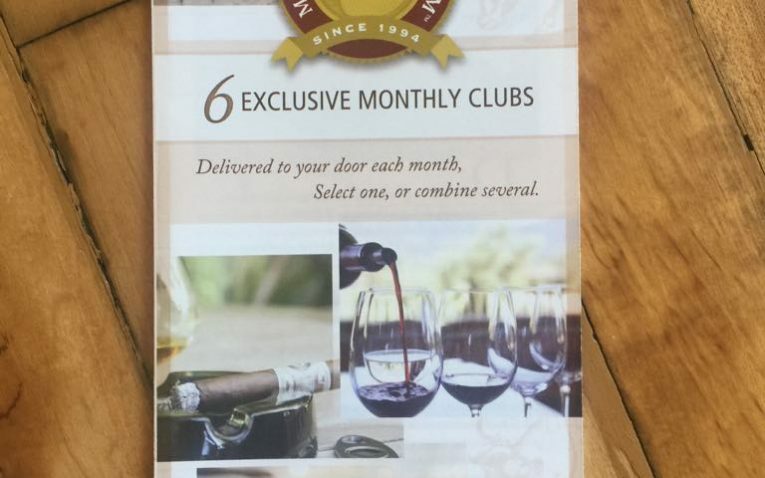 This is the most exclusive option you can get from this wine club. 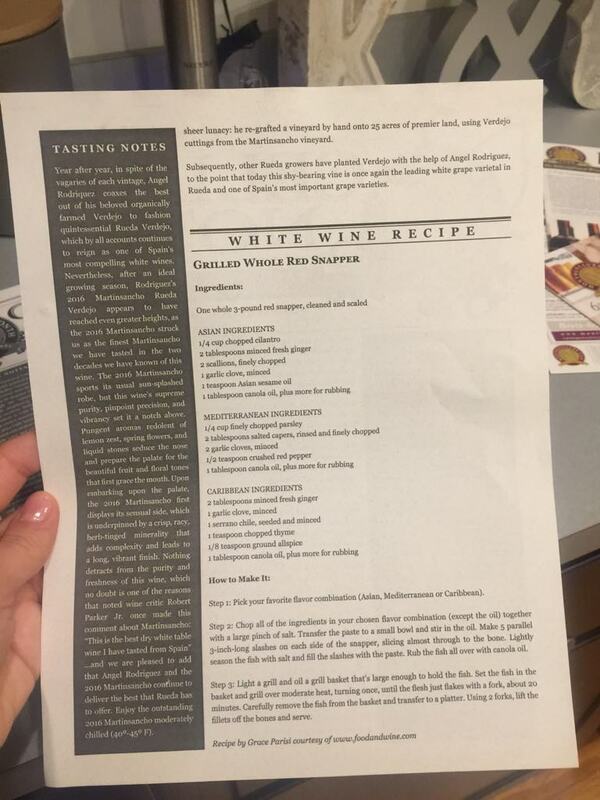 It has wines of extremely limited production and are the finest wines available. Many of the wines you will recieve are nearly impossible to find outside of the country in which they originate. 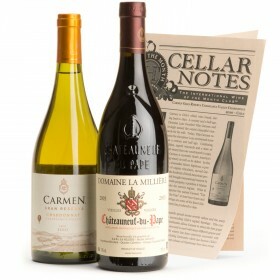 These wines have complex and intense flavors, are aged very well, and are very rich and full. It comes with all the features in the Premier Series. Packaging and shipping is pretty generic and plain. 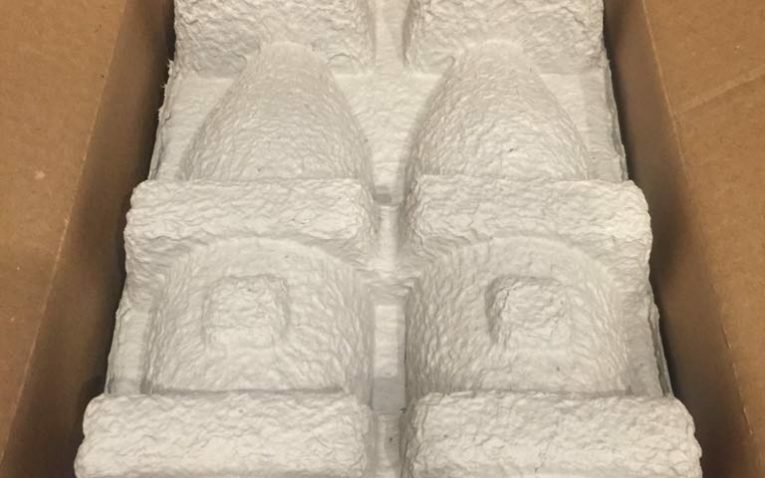 There is nothing unique or special about the boxes you get with your wines and the boxes do not even have a logo or name on it when they come. 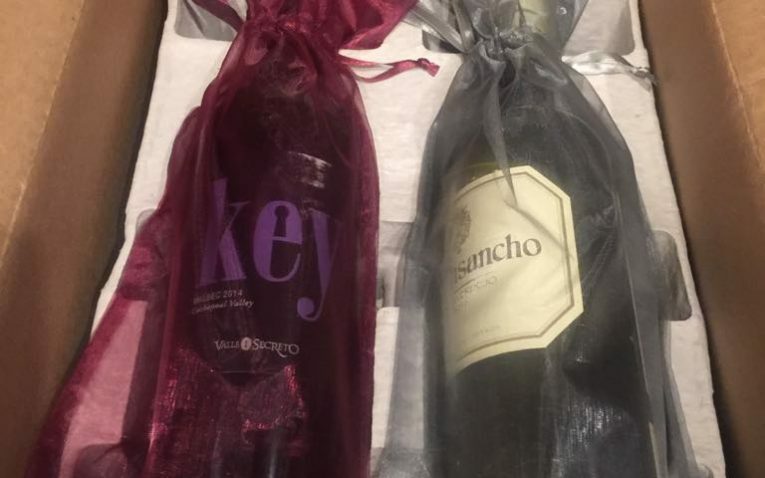 Other clubs take their packaging more serious and offer customers a better experience. 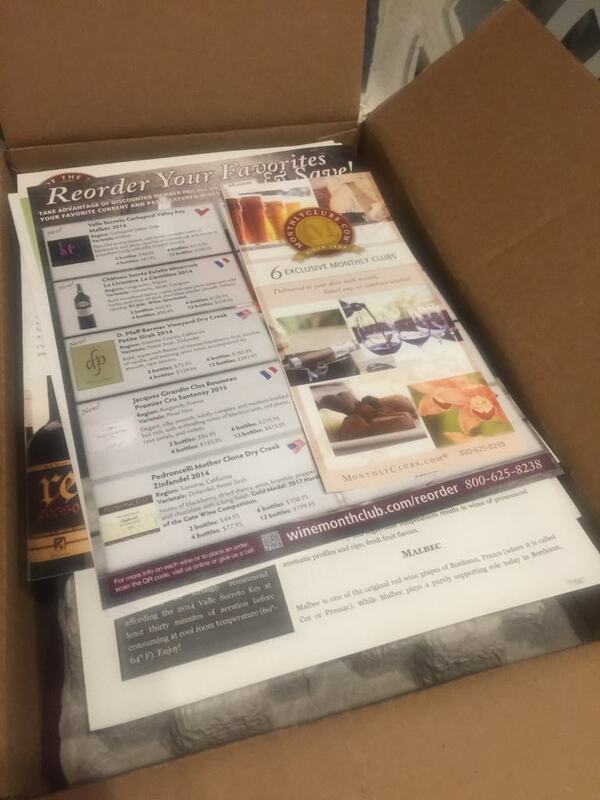 When you open the box, there are a ton of flyers and booklets laying on top and the wine is underneath separated by a cardboard protector to keep them safe. 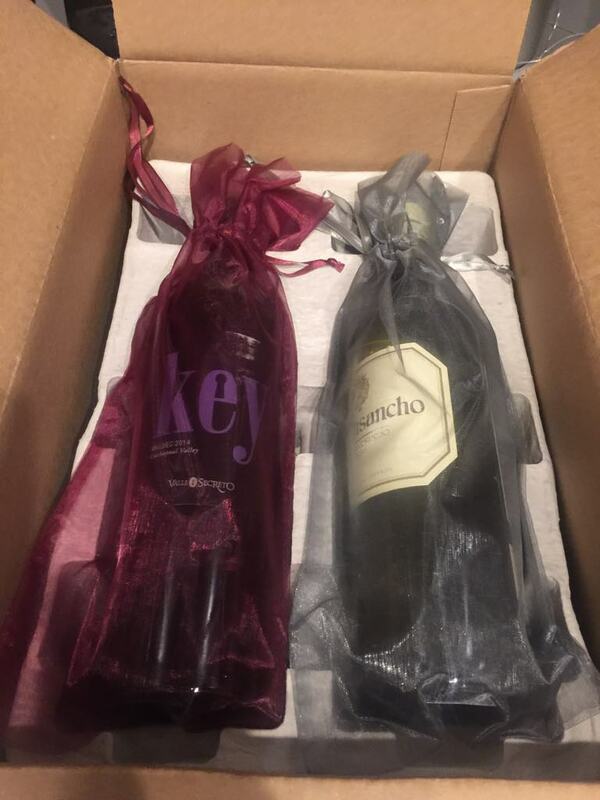 As stated on the Membership Information sheet included in the box, shipping is not the greatest compared to other clubs that send out their wines very quickly and can make it to your home a few days later. 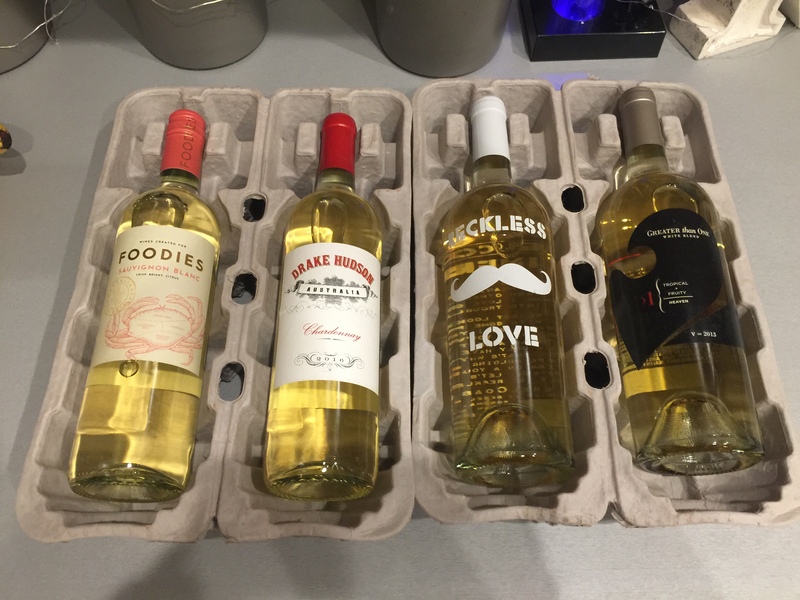 Regardless of when you order, the wine will leave their fulfillment center anywhere between the 15th and the 25th of each month. From there, it takes 7 to 10 business days from the 25th for it to get to your home. That is a very long shipping and waiting process and will not be appealing to a lot of customers. This club has a pretty decent selection of gifting options. Gift memberships are available from anywhere between 2 and 12 months, or you can even customize a different length. You are also able to choose the frequency you want the gift shipments to be sent out to your recipient. This includes monthly, bi-monthly, quarterly, or on specific months of your choice. 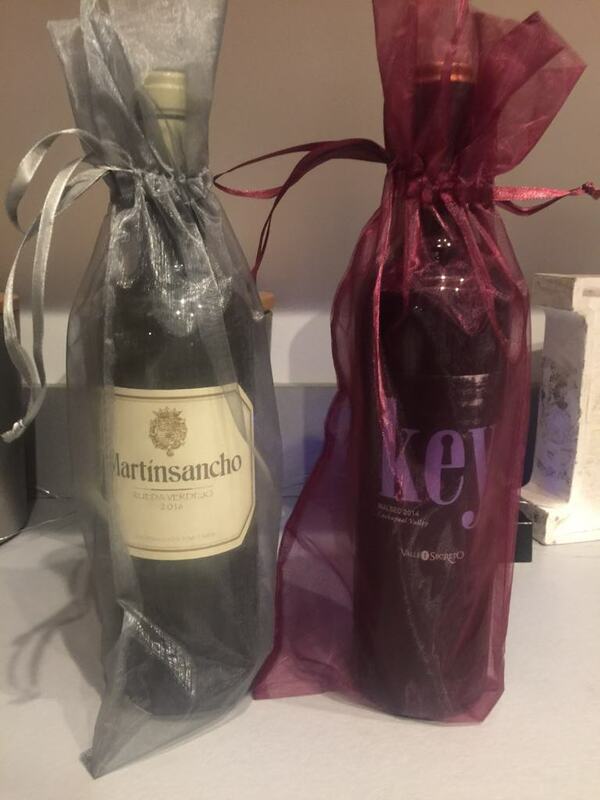 As you can see from our pictures the wines come wrapped in beautiful silver and red sachet bags. You can also request to have personalized gift notes and announcements mailed or emailed the your special person as well. Although you cannot choose the wines that are sent, you can choose all red, all whites, or a combination of both. 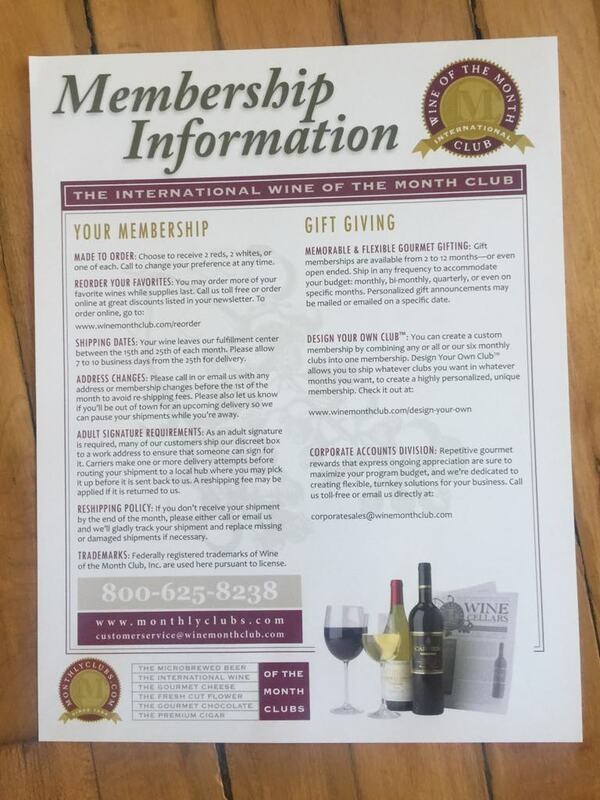 The thing that truly sets The International Wine of the Month club apart from their competition when gifting, is your ability to Design Your Own club experience. 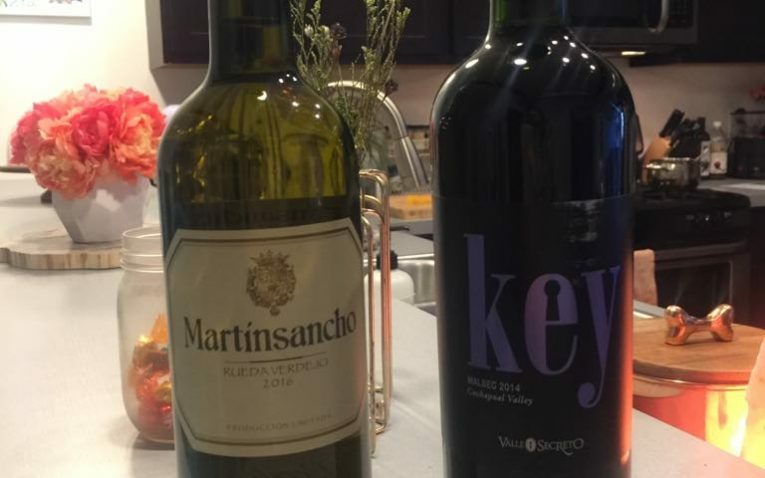 You can pick to combine one of their wine clubs with a sister club like chocolate, cheese, beer, cigars, or flowers and give a truly unique gift. You can even specify which month or months you want it delivered and you can pick different clubs for different months! The options are limitless. This club offers phone and email customer support. Phone hours are Monday through Friday 7am to 5pm PT and they do not have any weekend hours, which may be a drawback for some. They also have a live chat, which is always a really great feature for quick and easy responses to questions and concerns. To contact a wine expert, you will have to go through a few menu selections and you must call during business hours. 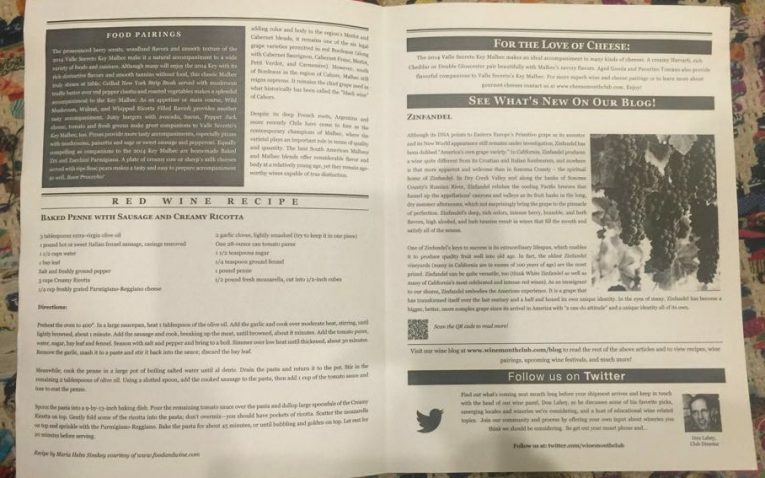 But, their website does have online tasting guides, pairings and winery information as well. Currently the club carries an A+ rating with the BBB, which is always something we like to see. 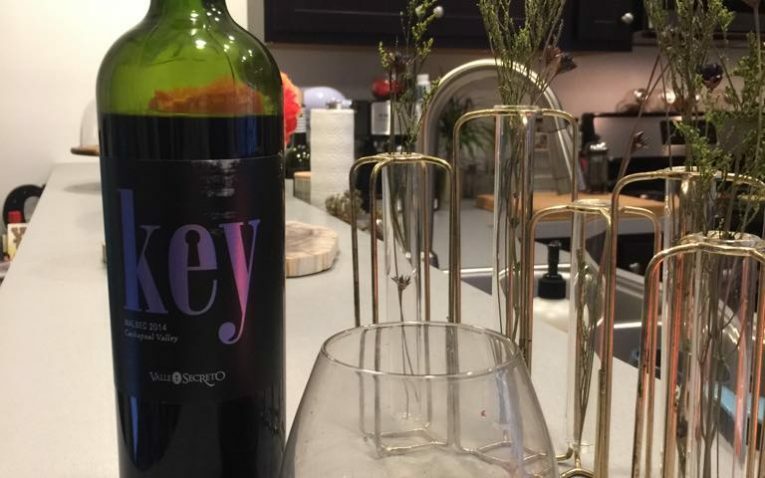 Wine quality is very good, so people who are most concerned about receiving wines from small batch wineries from around the world will really like this wine club. 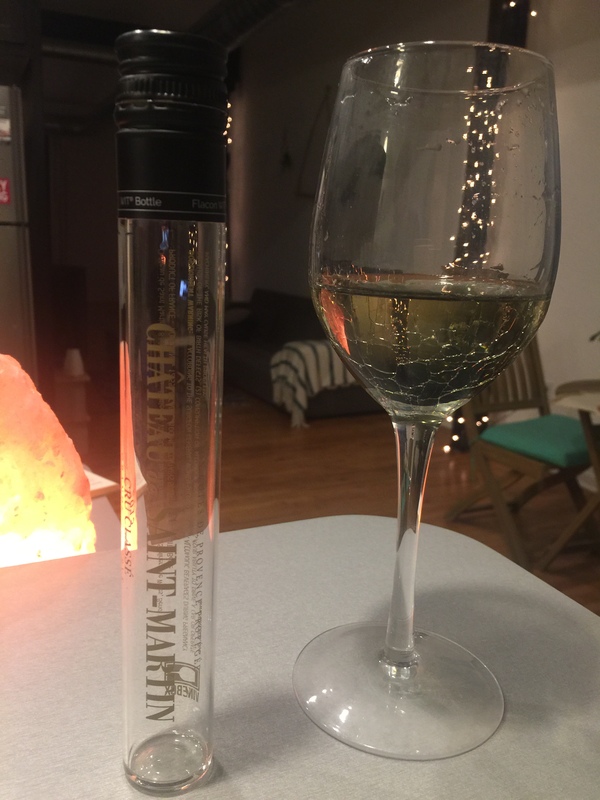 If you are looking for a club that gives a really fun and unique experience, is less traditional, ships quickly, and really focuses on packaging, this club will not be your best bet. 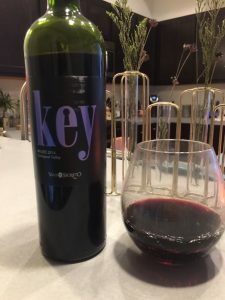 I would say this wine club is quite traditional and would appeal more to the older generations who are not concerned with a fresh, creative experiences and are solely focused on getting high-quality exceptional international wines. This club came with a ton of flyers and information to look through. 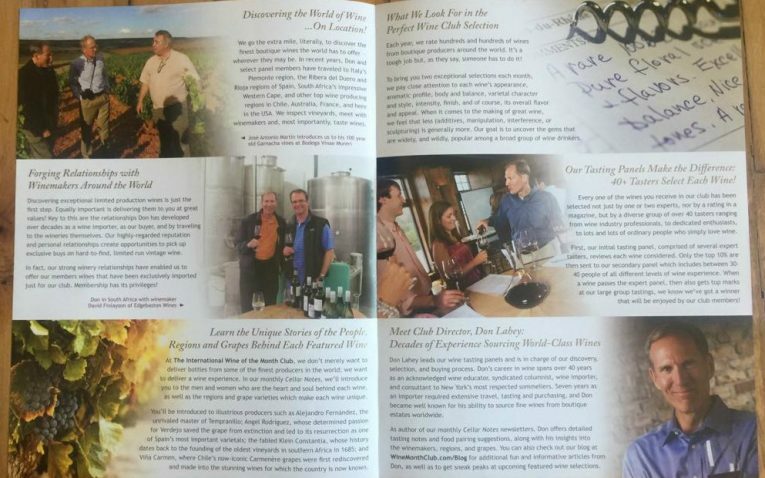 You get a sheet or small booklet with information about your wines and the wineries they come from. It features tasting notes, food pairings, a recipe to go with your wine, and detailed information on each winery. 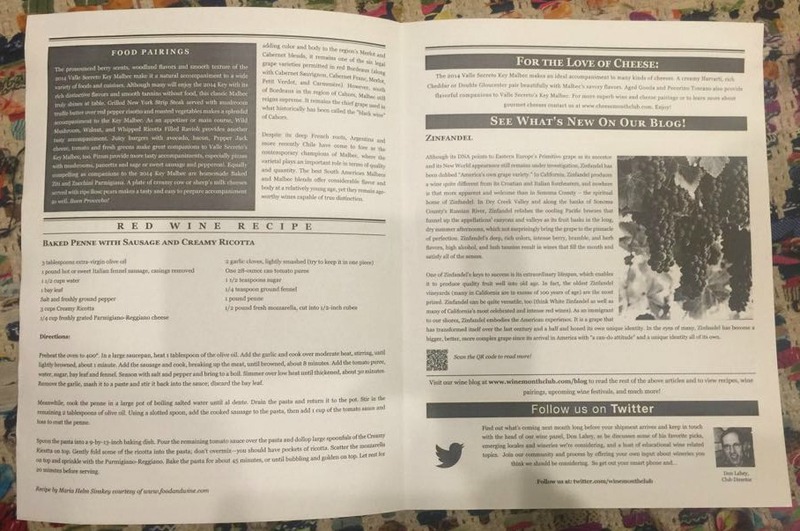 The red wine booklet had information about cheese pairing as well and a small snippet from their online blog. 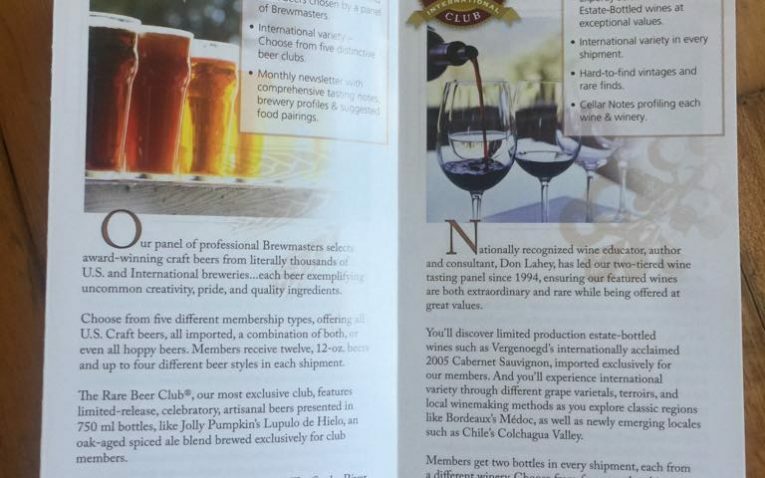 The other flyers were information on their Membership options and benefits, a Welcome booklet with info about the company, a flyer about how to order your favorite wines from your shipment and special discounts you can get. 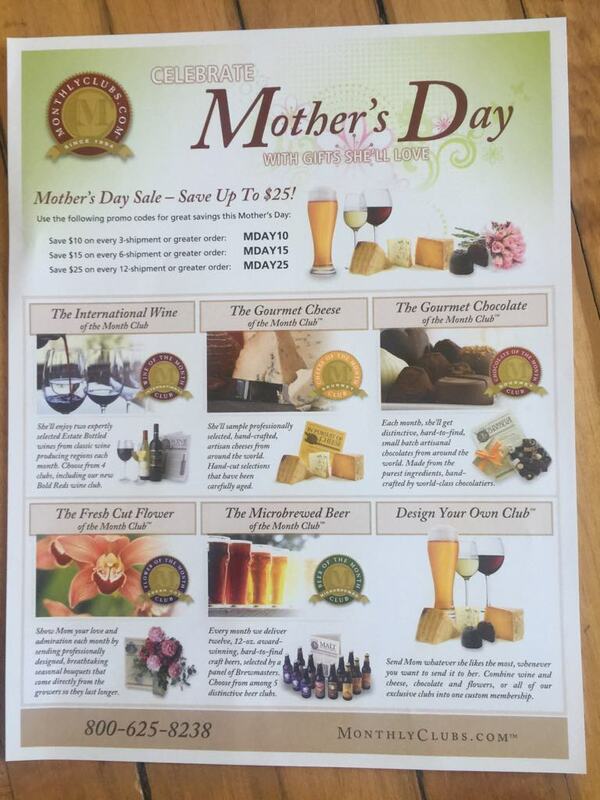 I also got a flyer for Mother’s Day specials. The Key red wine was probably one of the best red wines I had, an I am not a big fan of reds. 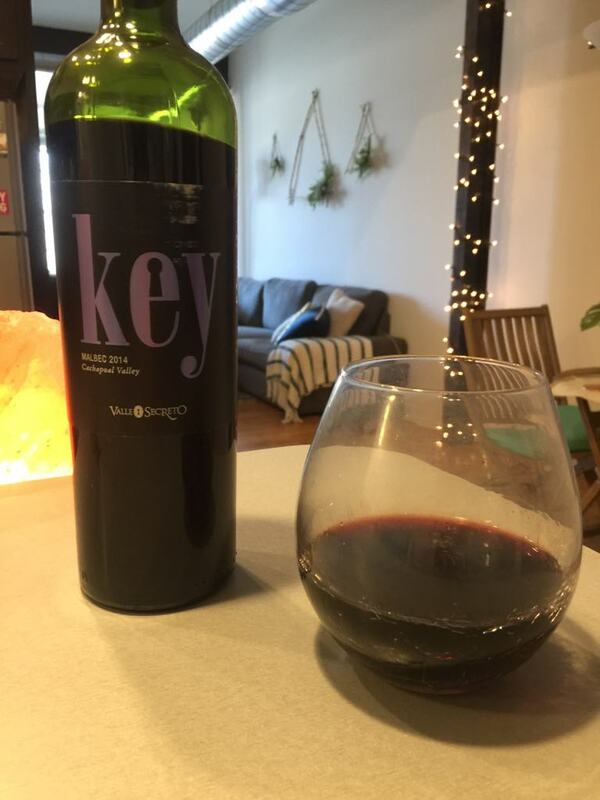 This red was balanced so well between with its acidity level and its slight bit of sweetness. 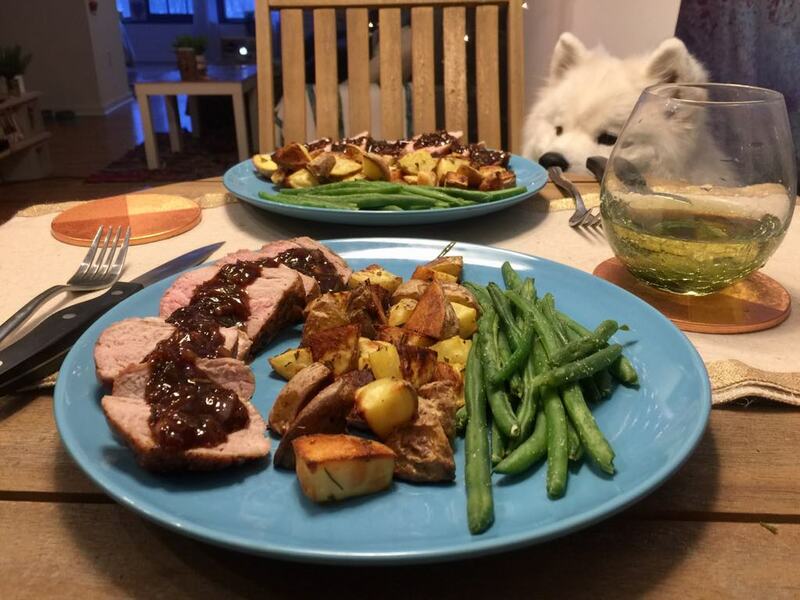 I was quite mild and non abrasive in flavor and was not harsh on the palate. It was smooth and very easy to drink. 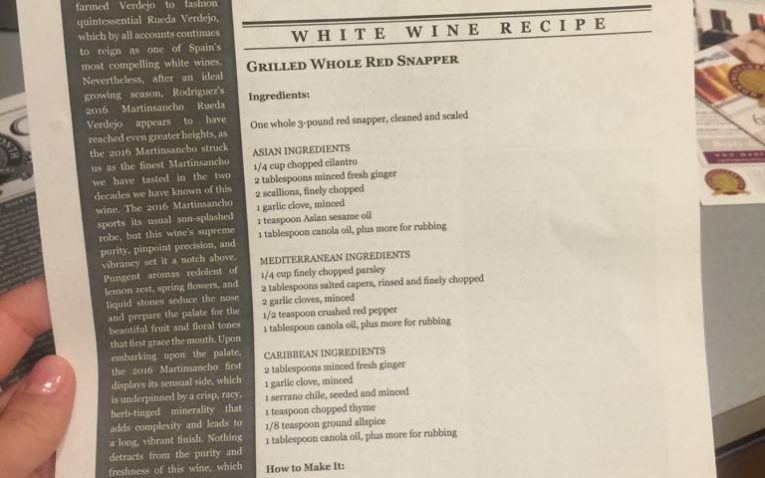 This red wine would pair very well with just about any dish, but is was particularly good with red meat. 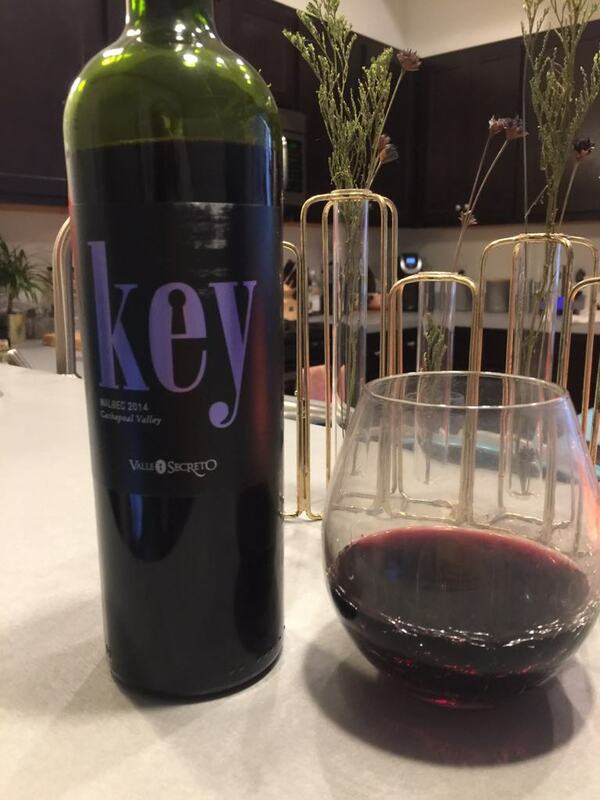 Its tasting notes were plums, blackberries, toasted oak, and cocoa. 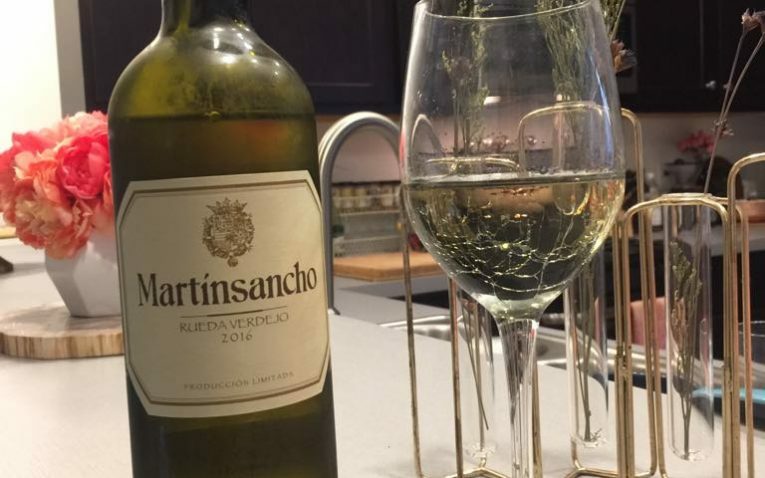 It’s a medium body wine with complex flavors, yet retains its smoothness. 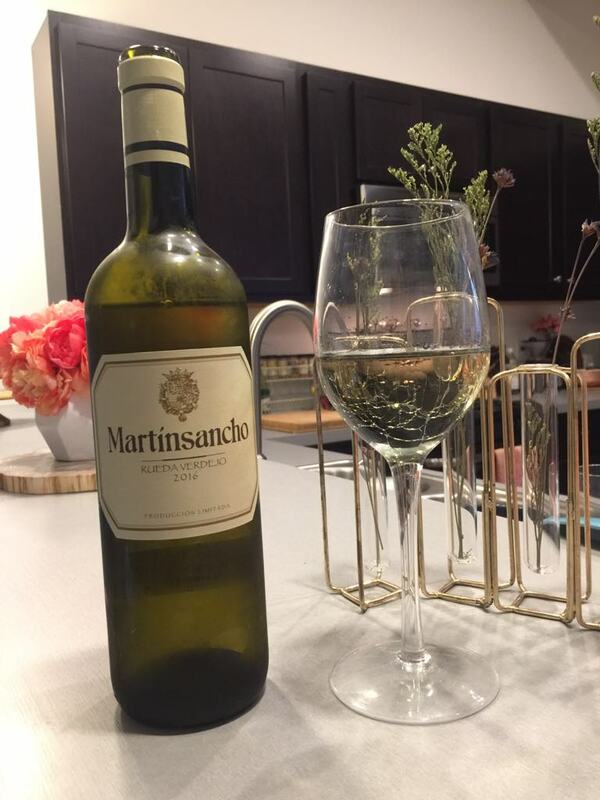 The Martinsancho wine was very good as well. It has lots of fresh and crisp citrus flavor, especially lemon, making it great with salads and seafood. It also has a great fruitiness and has floral undertones as well. 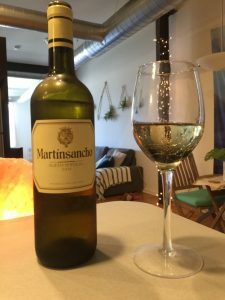 It is great for spring and summertime sipping. 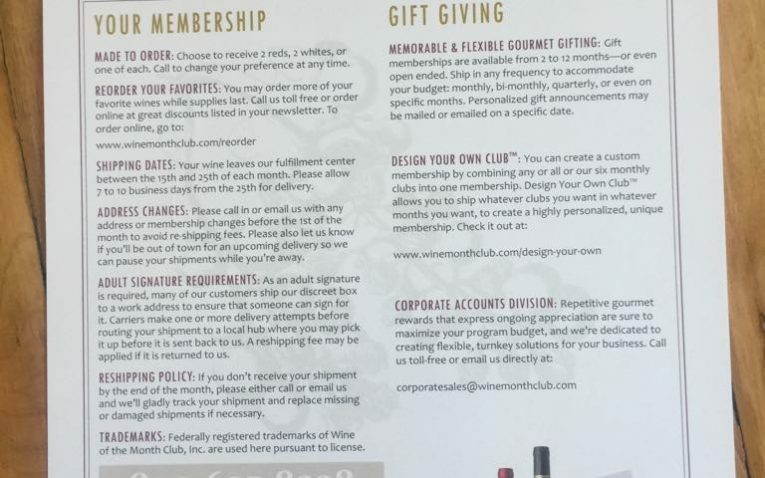 I like the fact that they have 4 different wine club options as they offer a good variety of wines, perks, and price. 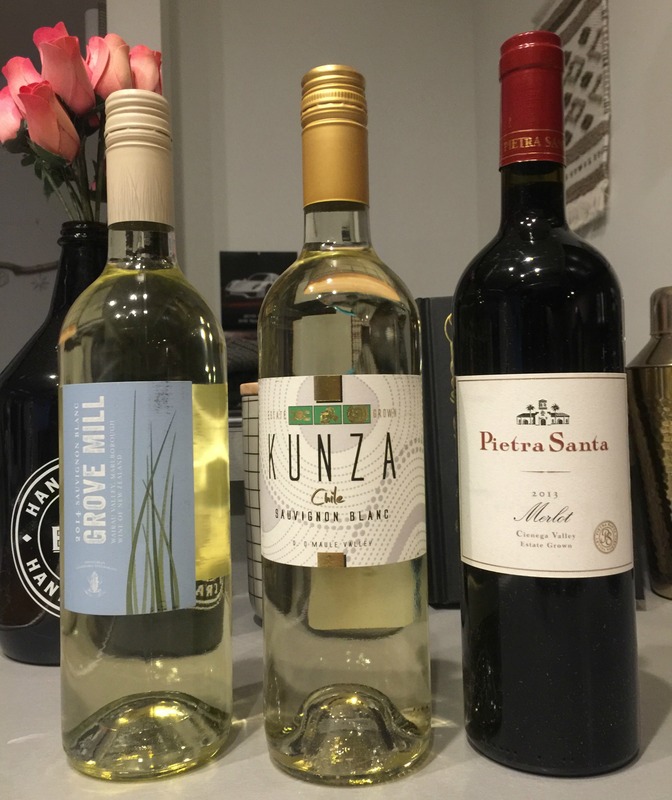 Although price(when you include shipping) is a little high for only getting two wines in each shipment, you need to consider that these are exceptional wines for the price and a great value. 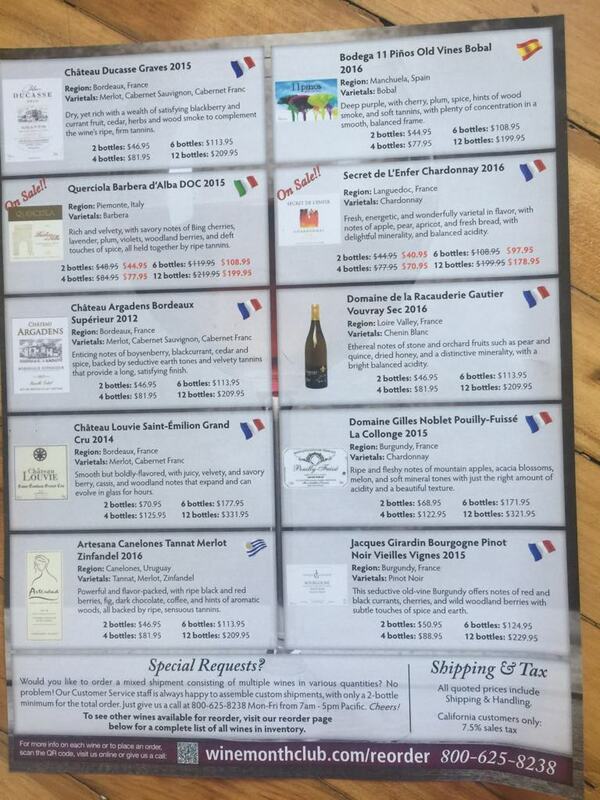 I like the detailed information your get about the wines on their flyers/booklets. 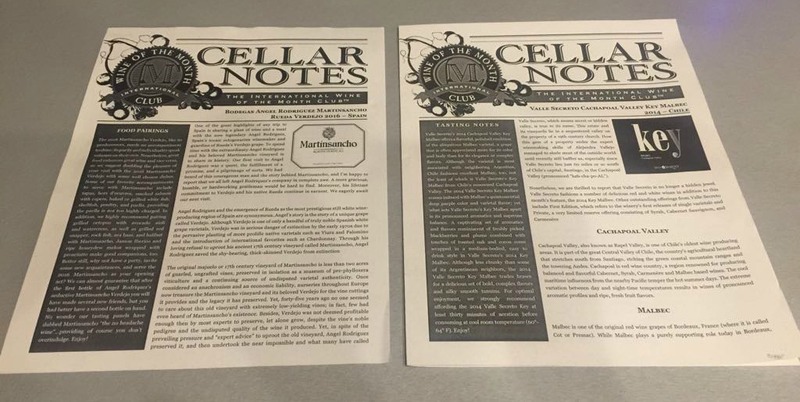 They are packed with information on tasting notes, food pairings, recipes for each specific bottle, and ample information about the winery the wine comes from. Many other wines clubs do not go into such detail. I feel Like the more detail, the better the experience. 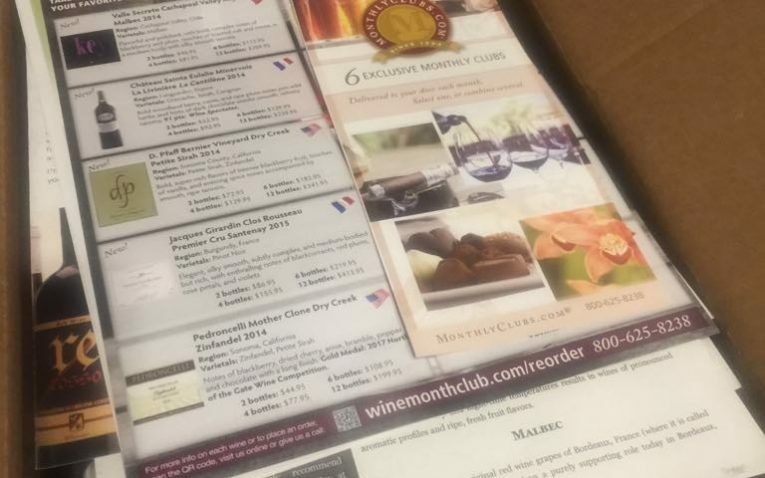 I love the idea of their “Design Your Own Club”, which allows you to combine their wine clubs OR combine a wine club with one of their other great clubs like chocolate, cheese, cigars, flowers and more. 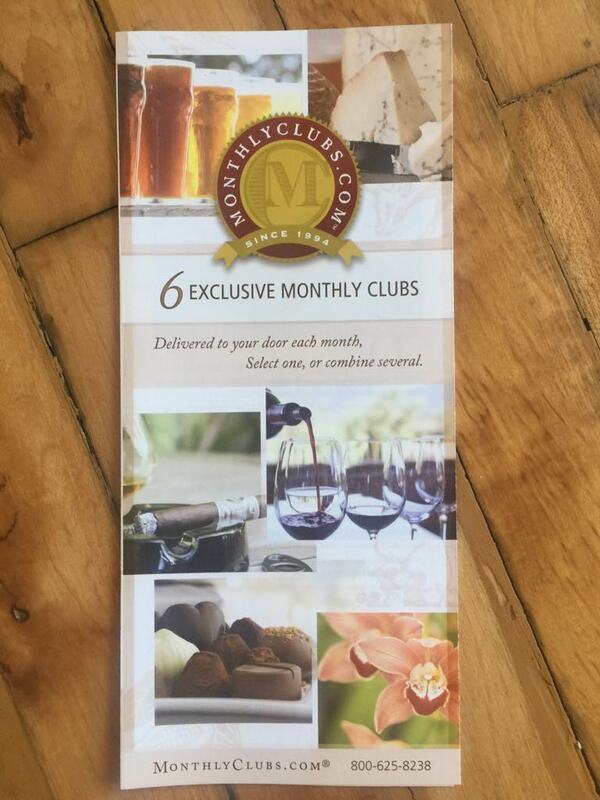 Not only can you create your own club experience, but you can choose which clubs you want shipped which months of the year – allowing you to have special clubs – chocolate and wine for example delivered in February for Valentines, but maybe Wine and Cigars in June for Father's Day, or Wine and Flowers in May for Mother's day. The options are truly outstanding when thinking of gifting or just for yourself! I also like how many gift options they have and how you can really customize your orders to fit your budget and preferences. 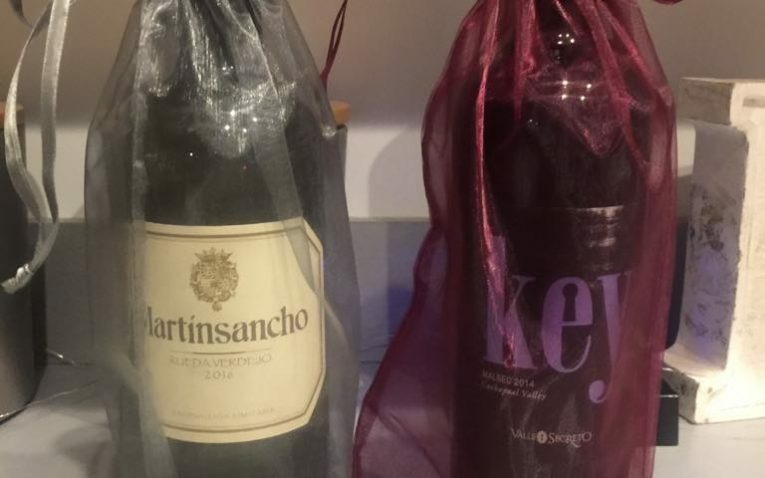 The fact that you can combine their wine club with other clubs like chocolate or cheese makes for a wonderfully fun gifting option. Many clubs do not have these options. I don’t like the fact they take so long to ship their wines and how limited their shipping date is. I would much rather order from a club that can send their orders the same week and I can get my delivery within a few days. If you order at the beginning of the month you will be waiting for your delivery for weeks which is very inconvenient, and also makes gifting difficult. They also don’t have many special features like special fun packaging and wine personality quizzes to match you up with the best wines for your taste, etc.. 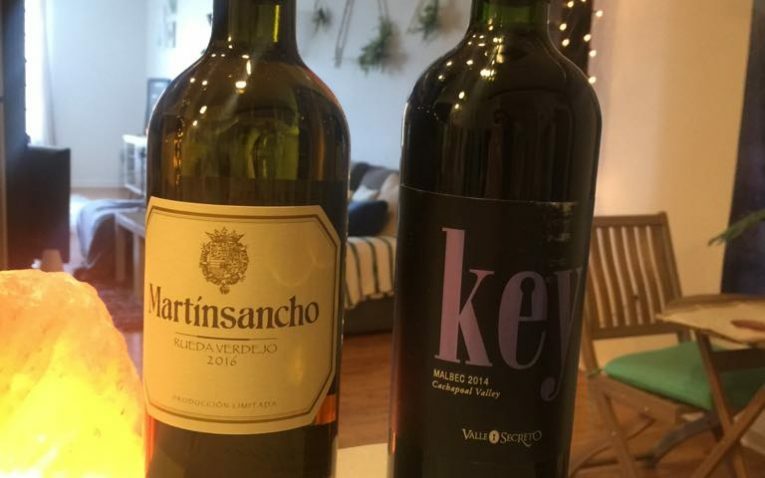 If you want extras like these and are looking for a club with a more fresh, updated feel that appeals to those looking for more adventurous, unique wines rather than traditional high quality wines then this may not be the club for you. Customer service hours are limited and they are not open on the weekends. 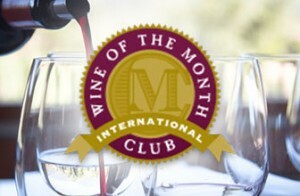 The International Wine of the Month Club has a great variety of wine and their quality is exceptional as well. 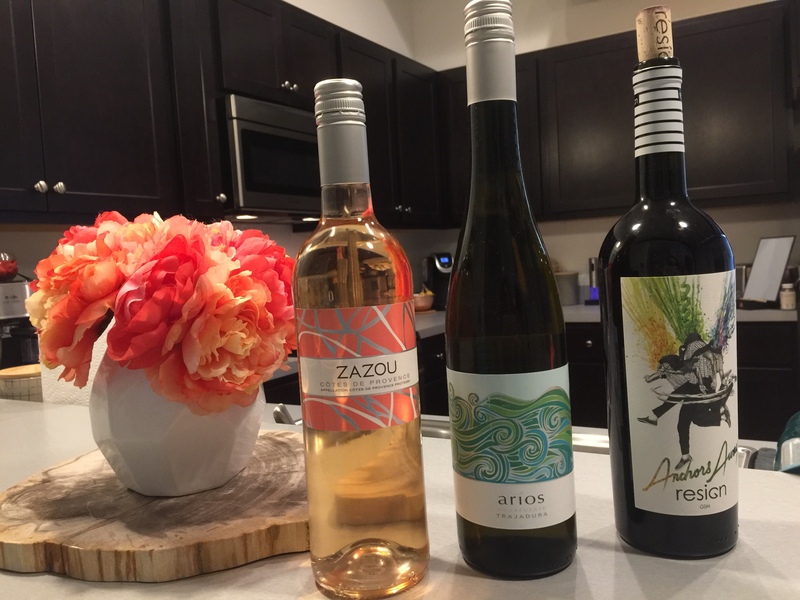 They focus on small batch wines from all around the world, give you a ton of helpful information on each wine you get, and have 4 different memberships to choose from to fit everyone's tastes and budget. 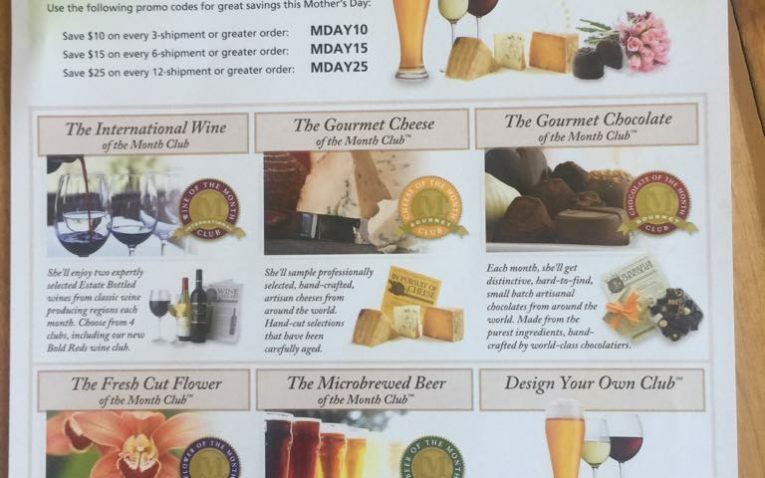 They also have sister clubs such as chocolate, beer, cigars, and cheese that you can combine with the wine to make a truly unique monthly subscription or gift subscription! However, there are a few flaws to be aware of, like the fact that they only ship towards the end of each month, which can make gifting somewhat challenging. They also have a flat $13 shipping on every order, and limited customer service hours. 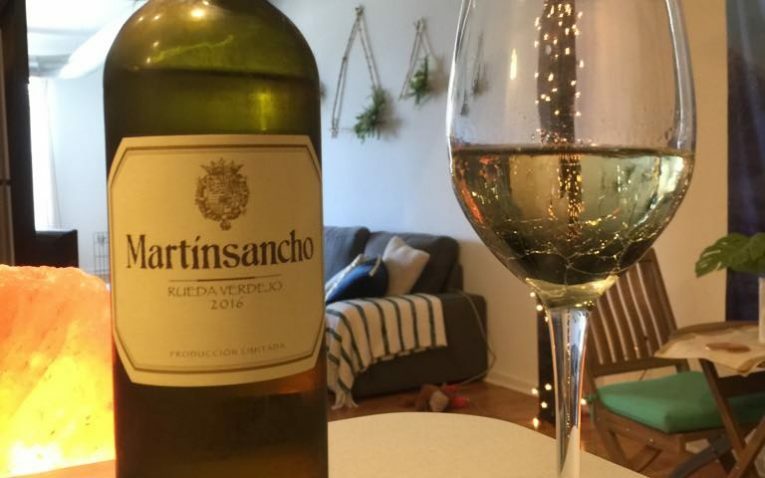 If however, you are strictly looking for exceptional quality wines and not a lot of extra frills, this wine club will more than fit your needs and is a great value. A company devoted to fine international wines. 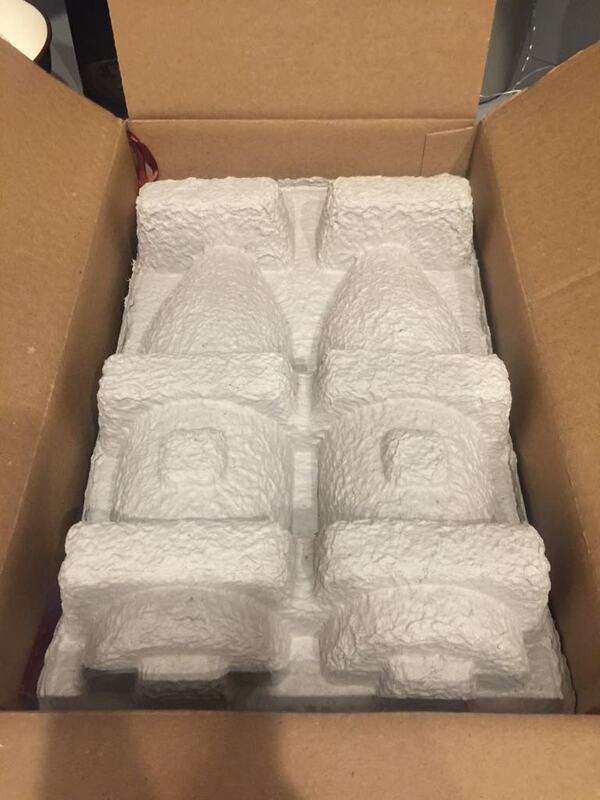 Packaging is not unique or special. 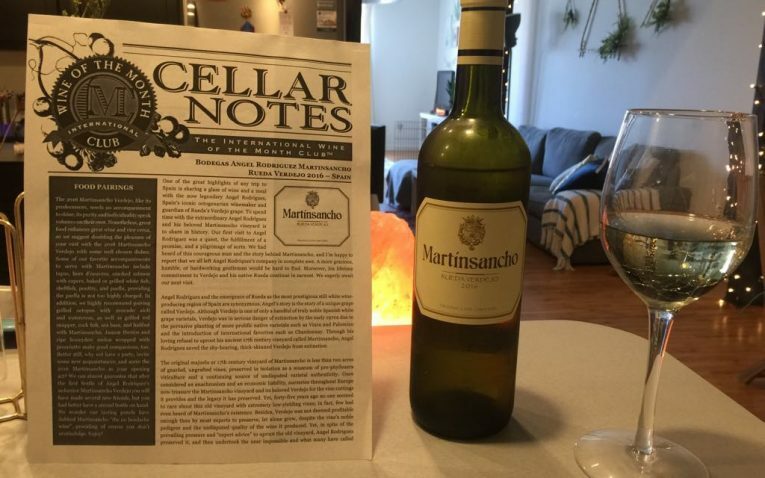 Flyers with information on wine could be easier to read and provide more visuals. 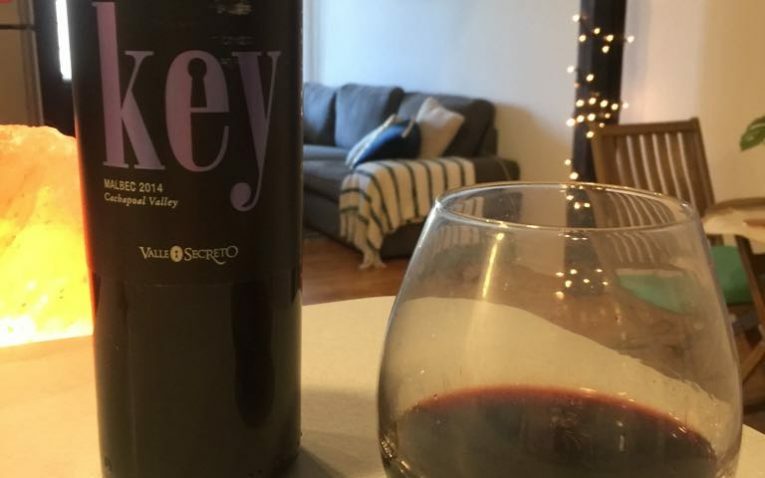 What Were the Best International Wines in 2013?